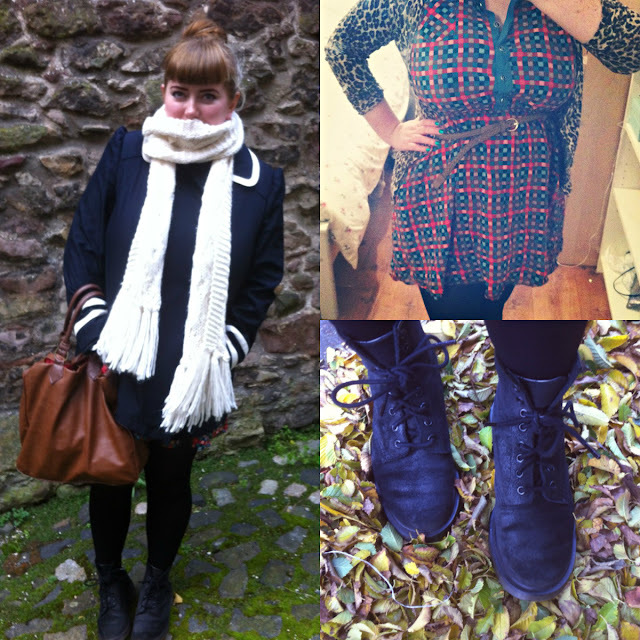 Ever So Juliet | Edinburgh lifestyle blog: Outfit: winter is coming! Brrr, it's cold out there! I'm trying to avoid the winter trap of wearing jumpers & jeans every single day, but it's hard! Especially when it's dark and chilly, and I just want to be as cosy as possible. This is my outfit from a slightly more colourful day. I'm clashing two patterns quite massively here, but I don't care! I think it's nice to be bright on a dull day (and I can never really resist leopard print). I've got my scarf pretty much glued to my neck at all times now. I bought this from Primark along with a matching cream bobble hat (and a couple of festive-looking cardigans). I try to avoid buying everything from Primark, but it's just so cheap & the knitwear is so colourful and lovely and hard to resist. Ah! Shoes-wise, I'm still living in my Doc Marten boots. They are SO comfortable and wonderful and brilliant. If you've ever considered buying them then do it! I really like this pair too as they don't have the traditional yellow stitching, so they don't look like I've nicked them from a grungy teenager. Hooray. Investing in a pair of Doc Martens is something every body should do! My parents were clever and bought me & my sister a pair each (which she so kindly later gave to me years later) when our feet stopped growing and 11 years later I still have them! Love your outfits, especially the clashing patterns - they totally work! I'd love a pair of Doc Martens but I'm unsure if they'd suit, I just heard they're long lasting and comfy which is always important in shoes! That scarf looks so warm, I love when winter comes round and it's perfectly acceptable to wear a scarf in the house when the heating is off!